What Neighborhood Features and Amenities Matter Most to You? Your home is your haven. It’s the place where you can escape from the rest of the world and just “be”. But step outside to your yard and beyond, and what makes the location improve your lifestyle experience at home? What neighborhood features matter to you? When choosing a new home, it’s essential to accept that life doesn’t begin and end at your front door. To make the most of where you live, choose a place that makes an impact on how you live. Naturally, you focus first on location. Everything you need (and want)—shopping, dining, healthcare, recreation—should be within reach. But wouldn’t it be great to expect more from your new neighborhood than a good location? Many communities are planned to deliver that result by including amenities. With a clubhouse, swimming pool, and fitness center, the residents have a resort-style experience as well as a place to gather. Parties and club meetings present opportunities to get to know your neighbors and build friendships. Pot luck dinners, cookouts, and holiday gatherings are popular ways to use the community’s amenities. Game nights could include poker, bridge, or some of the classic games, like charades. People in the community might also plan a movie night or movie marathon. During these events, members find common interests with one another, which sparks more gatherings, outings, and clubs. Are these the type of neighborhood activities that would enhance your life in a new community? Are you someone who likes the company of peers? Would you appreciate getting to meet new people? Do you want to try new things or even just share your hobbies and interests? If the answer is “yes”, then you should look for a community that offers more than a nice area of homes. The clubhouse is also a great place to host a family party, reunion, shower, or other event. It provides a convenient resource close to your home and can often be reserved for a private event. And, if you decide to invite neighbors to this party, you can welcome them into your expanded circle of friends! Your surroundings should also support your wellness. Biophilia—the study of the connection of people with other living things—suggests that we thrive when we build nature into our lives. A view of the outdoors or, better yet, an outdoor living space may promote well-being. A leisurely walk through a natural setting can be another mood-booster. So, a community that has incorporated walking trails encourages healthful activities. As a homeowner, you’ve probably had your share of exterior maintenance. From taking care of the lawn to painting the exterior, there’s plenty that has kept you busy. But if you’d like to pare down those responsibilities, put “low-maintenance lifestyle” on your list of community features that matter. Look for a neighborhood with maintenance included in your HOA (Homeowners Association) fee. Then, divert that time to something more fulfilling. Epcon Communities invites you to see what your life could be in a neighborhood that is designed to promote a relaxed, enjoyable, and healthy lifestyle. 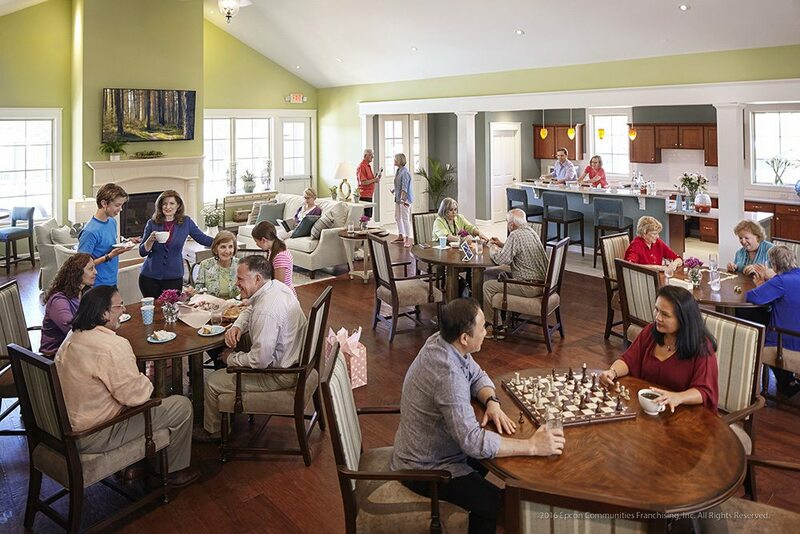 Residents of our single-family, low-maintenance homes enjoy the community amenities that cultivate friendships and enhance the comfort of living here. Epcon Communities are located around the country, so you might find one exactly where you want it! Take a look at our homes and contact us to take advantage of the features that really matter to you.